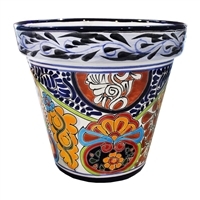 All of our Talavera traditional pots are handpainted and high fired. 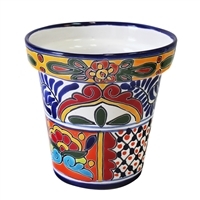 These make a colorful addition to any home or garden. All come with a drainage hole. 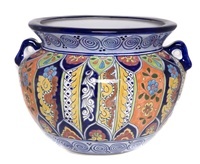 "Oval Window Box - 13.50""L x 5.75""W x 4.75H"
"Standard Pot - 16"" Diameter"
"Maceton Style Planter - 15""D X 14""H Decoration 1"
"Maceton Style Planter - 15""D X 14""H Decoration 3"
"Maceton Style Planter - 15""D X 14""H Decoration 7"
"Maceton Style Planter - 15""D X 14""H Decoration 8"
"PLANTER MACETON 15"" DIA X 14""HIGH"